"The Boutique Real Estate Group - A Worldwide Luxury Real Estate Company	| About Lighthouse"
Thank You for visiting Lighthouse Escrow! Our mission is to be California's premiere escrow company remarkable for innovation, expertise, personable and prompt service, and philanthropy. We are using the latest technology to help streamline and simplify the escrow process because we believe there's a smarter way to do escrow. From opening your escrows in Greenfolders to providing your closing documents on our custom Closing CD's, we're leading escrow into the digital age. However, as much as we love technology, we enjoy people more. Most important are our clients to whom we provide white glove service. Ready to try a new kind of escrow? We look forward to working with you soon! "I want to let you know we are incredibly appreciative of ALL you have done for us through this crazy deal. We truly believe this would not have turned out favorably for us had it not been for you… THANK YOU, THANK YOU, THANK YOU from the bottom of our hearts!!!" - Karen B. 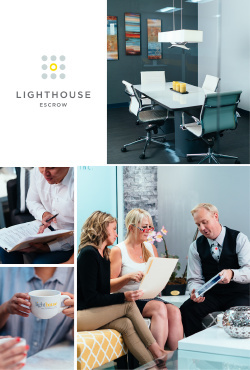 "We used Lighthouse to buy our first condo and we had a fantastic experience... I was impressed with their communication. They always answered our questions quickly and whenever any issues came up they let us know right away. We never felt like we were just another transaction, but felt taken care of throughout the whole process. We hit quite a few speed bumps in the process, none of them the fault of Lighthouse, but they helped us through them all. I would highly recommend Lighthouse Escrow." - Brianna & Joe A.